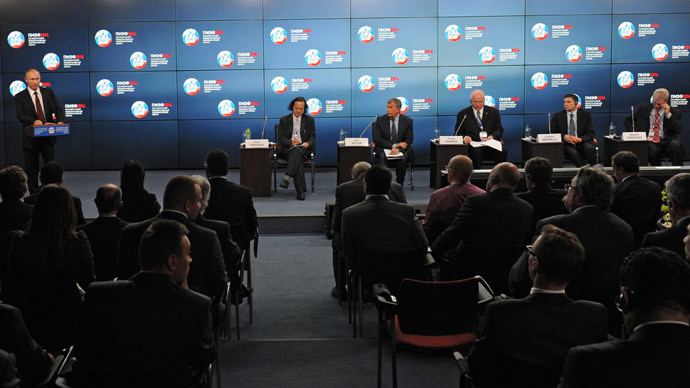 New global challenges, such as plunging oil prices and slowing world economies, the emerging economic blocks, as well as Russia’s anti-crisis plan, will be center stage at the 19th Economic Forum in St. Petersburg scheduled for this June. The meeting is being entitled “Time to Act: Shared Paths to Stability and Growth,” and will be held between June 18–20, 2015. One of the key topics at the St. Petersburg International Economic Forum (SPIEF) will be Russia’s economic game plan at a time when both the global and the domestic economies are losing steam. The session called “Russia: Seizing the opportunities” will feature “discussions and presentations dedicated to Russian industrial policy, structural reforms, crisis management measures, the shift to domestic sources of capital, monetary policy, regional development and continued steps to improve the Russian investment environment,” according to a news release Thursday. Other sessions will look at the ways to better coordinate ongoing integration, challenges in the energy sector, and ways to develop innovation and cyber security, that can bring Russia to a new quality level of growth. The forum gathers the business elite from all over the world to Russia and “will be marked by a variety of international events and formats. St. Petersburg has been chosen as the platform for key international events of this year’s business agenda: the SCO and BRICS Business Forums and the G20 Advisory Forum,” the statement says. Last year 175 deals worth 401 billion rubles were signed in St. Petersburg. Representatives from around 73 countries attended the meeting.